July 1 Update: Some tickets remain, to be sold on a first come, first served basis at the registration desk at Argyllshire Gathering Halls starting midday, Monday 16th July, cash only (no cards, no cheques). The grand finale to the Gathering: the day MacIntyres return to Glenoe with an enriched connection to cultural heritage. For many people, this is a once-in-a-lifetime opportunity to inhabit the same geographical space and walk on the same lands of their ancestors. Shuttle buses from Oban to the Taynuilt Pier. Boats from the Taynuilt Pier to Glenoe. We have tentatively reserved four, twelve-passenger boats that take ten minutes from the Taynuilt Pier to Glenoe. Each of the four boats will take 12 people to Glen Noe and then return for the next group. The boats leave at 11 a.m., 11.30 a.m., 12 noon, and 12:30 p.m., with the possibility of another trip if needed to get everyone to Glenoe by 1 p.m. The return trips will start at 3 p.m., immediately after the Cairn ceremonies and will end about 6 p.m., after the Hog Roast. For those few individuals with special mobility needs, arrangements could be made to travel all the way by vehicle, but you must tell us as soon as possible that this is necessary by emailing admin@macintyregathering.com . Viewing Ben Cruachan, Loch Etive, and Lairig Noe, the mountain pass below Ben Cruachan. This mountain and mountain pass protected MacIntyres from the rest of the known world for centuries. Hiking to MacIntyre Falls on the River Noe (a limited number of hikers before and after the main festivities). 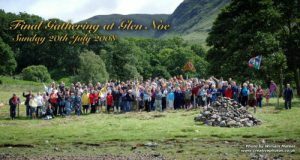 The Gathering attendees will arrive at Glenoe by whatever means and will assemble around the Cairn with their clansfolk, singing the MacIntyre March. This will take place in the meadow adjacent to the Cairn on the shore of Loch Etive. The main festivities are at the meadow on the shore of Loch Etive, where the memorial Cairn is located. A time capsule will be place on the Cairn. Each of the assembled MacIntyres will add a stone to the memorial Cairn until the time capsule is well within the Cairn. Performances: piping (newly composed piobaireachd, “Gathering of the MacIntyres”), the Highland Fling, and singing of the MacIntyre March. Group photo taken from a boat on Loch Etive. If the weather is so bad that we don’t want to linger at Glenoe, we will still take the boats up to visit the Cairn for the official ceremonies, barring the unlikely event that the weather would be so bad that the boats cannot get up the loch. In any case, as mentioned before, this is a once-in-a-lifetime opportunity for some people to stand on Glenoe, so we won’t let a bit of rain stop that from happening. In 2008, we had a traditional hog roast after the final Gathering activities, which was a lot of fun and a good way to wind down while enjoying the scenery and company of the clansfolk. It will take place at 3.30 p.m., just after the official Gathering activities. This event will be an ideal way to wind down the emotions after five days of continuous activities. In 2008, we were lucky that there was no rain, only wind. Cross your fingers for another sunny day in 2018! However, if the weather is indeed too miserable, we will move the Hog Roast and other ceremonies to the Gathering Halls. The shuttle bus from Oban to the Taynuilt Pier and back. The boat from the Taynuilt Pier to Glenoe and back. You can buy event tickets only if you have already registered for the Gathering. Please ensure you have done this before trying to buy tickets. Your username and password were emailed when you created a user account after registering. These activities are still “proposed” until we have sufficient registrations to cover costs of running each event or activity. We will do our very best to provide activities as listed; however, they may be cancelled or modified due to bad weather, lack of attendance, changes in availability of transport, or any other factors beyond our control. If a tour is undersubscribed and is cancelled, we will work with you to find a replacement activity or tour. Please read the event descriptions carefully and use your own good judgment as to whether an activity is within or outside your physical ability. If you feel it might be beyond your ability please tell us as soon as possible. We will do everything in our power to provide modifications or assistance, but in some cases it won’t be possible or feasible for some people to take part in some activities.